T'ai Chi Ch'uan is translated as "supreme ultimate boxing". The "supreme ultimate" part refers to the Chinese concept of the origin of the universe. Out of the infinite potential of the void arises the dual principles of yin and yang. Yang being the male, warm, forceful, light principle, and Yin being the female, cool, yielding, dark principle. Neither one of these principles is superior to the other, and both are necessary because each contains some of the other. They are two sides of the same coin. The yin-yang symbol is also a symbol of T'ai Chi. T'ai Chi Ch'uan is a harmonious dance of yin and yang sometimes referred to as “meditation in motion”. Master David Schenk was the founder and head instructor of the Center for Body Mind Harmony. We had the honor of studying with him for 17 years, until his passing in 2007. The school still continues under the direction of Sifu Gary Harris. T�ai Chi was originally practiced as a martial art emphasizing strength and speed. Through time it has evolved into a gentle form of exercise that can be practiced by people of all ages. It consists of a sequence of movements that are performed slowly, softly and gracefully with smooth, even transitions. In Chinese philosophy and traditional medicine there exists the concept of 'chi' (chee), a vital force that animates the body. The Japanese word for this is 'ki' (key) and in Yoga this energy is called ‘Prana’. T’ai Chi practice encourages the circulation of chi within the body, improving health and vitality. Chi moves through the body in patterns that are closely related to the nervous and vascular systems. T’ai Chi practice promotes a tranquil and focused mind. Breathing is coordinated with movement and the meditative nature of the exercises is calming and relaxing. Correct practice can lead to improved balance, strength, coordination, flexibility and fluidity of movement. Many practitioners notice improvement in posture and alignment. Currently, there is a lot of research that indicates T'ai Chi practice is beneficial for those suffering from a number of ailments including: Arthritis, COPD, Parkinson's, and more. Learning the form can help your memory, too! Tuesday Classes, 4:00 - 5:15 pm, next session begins April 23, 2019. Six Weeks, $65 payable to Laura Kolinski-Schultz. Drop in for $15. Drop in reserved for students who have attended at least 2 regular six-week sessions within the past year. Yoga Central - Cleveland Ave. N, Canton, OH, across the street from the Raisin Rack. Call me at (330) 324-9319 for more information. Wednesdays, 7:30 - 8:45 pm beginning April 24, 2019, and Saturdays, 10:00 - 11:15 am, beginning April 27, 2019. Six Weeks, $65 per person per 6-week session. Pre-Registration is required. Go to www.theyogaplaceohio.com to register online, or contact me directly at (330) 324-9319 or terraki2@yahoo.com. The website is set up for individuals signing up for one class per week for six weeks. If your circumstance is different, please contact me for details. One person, two classes per week: $120.00. Two people from the same family, One class per week: $120.00. Two people from the same family, Two classes per week: $240.00. You may pay me with a check, cash or credit card ahead of time or the first day of the session. Make checks payable to Laura Kolinski-Schultz, or register online with a credit card at www.theyogaplaceohio.com. If you are planning to sign up for more than one class a week, or if multiple members of the same family wish to sign up, please contact me first. It may be less complicated to pay me directly than to register online. terraki2@yahoo.com. Join us at the Home Dojo for the Summer 2019 session! Open to all levels. We play outdoors in good weather, so please dress appropriately and wear good shoes. No sandals. You may sign up for 6 weeks ($60) or 10 weeks ($95). Classes will begin the week of June 10, 2019. Check back for exact dates. Call (330) 324-9319 for more information, or email terraki2@yahoo.com. Discounts are available for more than one family member. If you have already taken at least 2 regular (not Intro.) 6-week sessions during the last 6 months, you may drop in for $15 per class. Contact me to register: terraki2@yahoo.com or (330) 324-9319. Held on Saturdays, 11:30 am - 12:15 pm. Six weeks beginning April 27, 2019, $45.00 per person. We will focus on stretching, warm up exercises, basic T'ai Chi principals, movement and Qigong. Check out this beautiful location right across the street from the Raisin Rack on Cleveland Ave. Wear loose comfortable clothes and soft, flexible shoes. We will be outside when the weather is good. If it rains, we will be inside. You may wear shoes inside, but they must be for indoor use only, and have white soles. Call (330) 324-9319 or email me at terraki2@yahoo.com for more information. You may make up a missed class at any of the locations or times during the session that you are in currently. For more information call (330) 324-9319 or send me an email terraki2@yahoo.com. Pre-Registration is required for these classes! April 23, 2019. Tuesdays, 4:00 - 5:15 pm. New classes begin every 6 weeks. Tuition: $65, payable to Laura Kolinski-Schultz. or go online to www.theyogaplaceohio.com. Laura Kolinski-Schultz has studied martial arts since 1974. She began her journey with Isshin-ryu, an Okinawan style of Karate, and holds a 4th degree black belt in that style. A desire to explore the internal styles led her to T'ai Chi in the early '80's. She studied Chinese Martial Arts with Master David Schenk of the Center for Body-Mind Harmony in Tallmadge, Ohio from 1990 until his passing in 2007. Laura is a Disciple of Master Schenk and is certified to teach T'ai Chi, Qi Gong, Push Hands, and all Internal Martial Arts and related exercises. Laura teaches T'ai Chi at Yoga Central in Canton and The Yoga place in North Canton. David Kolinski-Schultz performing with Ba Gua Deer Horn Knives. 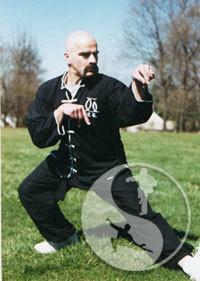 David began his study of Chinese Martial Arts with Master David Schenk in 1992. He has earned 10 gold and 6 silver medals in local and regional tournaments in T'ai Chi, T'ai Chi Sword, and Ba Gua. He is a Disciple of Master Schenk and is certified to teach T'ai Chi, Qi Gong, Push Hands, and all Internal Martial Arts and related exercises. David was one of the first teachers to be certified by Master Schenk. He teaches at Yoga Central in Canton with Laura. across from the Raisin Rack in Canton, and The Yoga Place, at the corner of Portage and Whipple in North Canton. The new six week class sessions will begin the week of April 23, 2019. Check the website, www.theyogaplaceohio.com or call me for details. Call 330-324-9319 or email me at terraki2@yahoo.com to register. New! Private lessons at the Home Studio. Lessons are 1/2 hour, $30. Call 330.324.9319 to register. If I travel to you, add $1 per minute of travel time to and from your location. For more information about T'ai Chi and Chinese Martial Arts, please visit the Center for Body-Mind Harmony at http://www.bodymindharmony.com.